Okra is one of those vegetables that many people may not know about. Many claim it originated in Ethiopia and was introduced to Europeans and Americans during the transatlantic slave trade. Some also say the Egyptians were the first to cultivate okra, in the basin of the Nile. Now, some people are hesitant to incorporate this vegetable in their diet. It’s actually pretty mild in flavor with a crunchy texture, peach-like fuzz on the outside and edible seeds in the inside. But things can get a little sticky, or perhaps I should say slimy, with okra. When opened, it releases a gelatinous or gummy substance called mucilage. This substance is often used as a thickening agent in gumbo stew, soups and sauces. If you are preparing okra outside of a soup, stew or sauce, you can eliminate the sliminess by soaking it in vinegar for about an hour prior to cooking. And when you cook okra on high heat, like when grilling it, this will help reduce the mucilage. You can also saute okra with tomatoes which is a nice pairing, because the acidity of the tomatoes mitigates the mucilage. But keep in mind, the slimy part of okra is also partly what makes okra such a healthy food. For example, the slimy part or the mucilage is associated with healthy functioning of the liver. Okra may also have anticancer properties. One study found that okra contains a specific type of lectin (a carbohydrate-binding protein) that proved to have antitumor effects in human breast cancer cells. Researchers found that this lectin reduced cancer cell growth by 63 percent and killed 72 percent of the human cancer cells, according to a report referencing the study. The use of okra for diabetes management has also been widely studied. According to another study, okra extract improved blood sugar levels of pregnant rats with gestational diabetes. Soluble fiber is a type of fiber which dissolves in water and swells like a sponge in the stomach, giving food a jellylike bulk. It combines with fat in the intestines and pulls it out of the body before it can enter the bloodstream. It is soluble fiber that may help lower blood cholesterol, slow the absorption of car­bohydrates from foods and help stabilize blood sugar levels. Insoluble fiber, which okra also contains, does not blend with water but adds bulk to the stool which helps prevent constipation. The National Institutes of Health (NIH) reports that antioxidants in okra seeds may have anti-fatigue properties. This may explain why roasted, ground okra seeds have historically been used as a coffee substitute. Calcium, 123 mg. Calcium is important for building and maintaining strong bones and teeth. This mineral is also important for maintaining hair and nail health in perimenopausal and menopausal women. Adequate calcium intake may also decrease your risk for colorectal cancer. Magnesium, 58 mg. This mineral is needed by more than 300 human body enzymes to facilitate biochemical reactions. It helps create energy for the body and activates muscle and nerve tissues by enabling potassium and calcium transfer through your cell membranes. If magnesium levels in the body are too low, whole body systems don’t work properly, resulting in fatigue and cramps. Phosphorus, 51 mg. This mineral works with calcium to help build strong bones and teeth. It is also needed to help balance and use other vitamins and minerals including vitamin D, iodine, magnesium and zinc. Sodium, 10 mg. Sodium is one of the most important minerals in the human body. It regulates your body’s fluid levels while keeping your brain sharp. Sodium also prevents your muscles from cramping and even defends your skin from free radicals that accelerate your aging process. Due to the high consumption of processed foods in the United States, most Americans do not have a sodium deficiency. It is best to avoid these processed foods and get your sodium from natural, plant-based foods such as okra. Vitamin C, 26.1mg. You likely know about the immune-boosting benefits of vitamin C, but what about this nutrient’s importance regarding aging? Read here to find out. Folate, 74 mcg. Most adults need about 400 mcg of folate daily. If you are pregnant, you may need more. Folate is essential for cell growth and many other bodily functions. Vitamin A, 453 IU. This vitamin is an antioxidant that supports the immune system and is good for skin and eye health. Vitamin A also promotes cell growth. Vitamin K, 64 mcg. This vitamin is critical for proper blood clotting and bone metabolism. It may also help maintain brain function, a healthy metabolism and may even help prevent cancer. Ways to incorporate okra into your diet? Okra makes a great thickening agent for soups, stews and sauces. The oil of okra can also be extracted and used as a vegetable oil alternative. 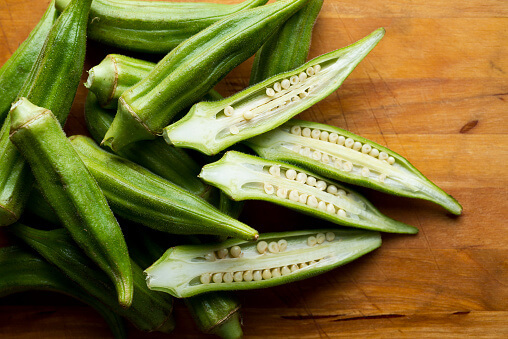 Okra is also great pickled, especially when you are craving something crunchy and salty. Roasted okra for a simple side dish is something I will be trying. It would be a nice change from my rotation of vegetables which usually includes other green veggies, like broccoli and spinach. If you are taking blood thinners, talk to your doctor before adding okra to your diet. The high amount of vitamin K in okra may interact with blood thinner medications. People on the diabetes drug metformin should also speak with a doctor first. To be on the safe side, discuss any medications you are on (or any existing health problems) with a competent healthcare professional, both prescription and over-the-counter, before adding okra to your diet. You always want to try to avoid a drug interaction.